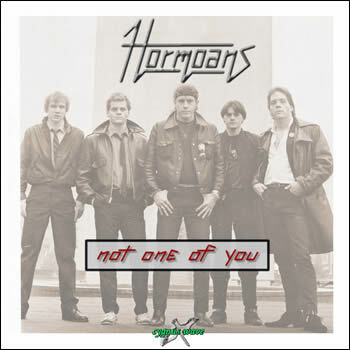 In December 1981, the new wave band Hormoans recorded a few dozen tracks made up of their original compositions along with original “translations” of some standard material. The recordings were made at Future Sound Studios in Harrisburg, PA with all the songs recorded “live” by the band and mixed down to Stereo Digital Audio Tape. Unfortunately, the band broke up soon thereafter and these recordings remained “lost” for over a quarter century. Finally in 2008, these recordings were remastered and produced to form the Cygnus Wave album Not One of You. The album includes 12 songs from the Future Sound session along with a live recording of “Stürmish Ding”, a German-language version of The Troggs’ “Wild Thing” recorded live in 1982. Tagged Albums Co-Produced by Jim Hammond, Albums Co-Produced by Ric Albano, Harrisburg PA, Jim Hammond on Vocals, Paul Smith on Guitars, Songs from 1981, Songs from 2008.